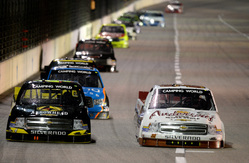 FORT WORTH (November 1, 2014) – Ben Kennedy was off to a strong start as the NASCAR Camping World Truck Series (NCWTS) took on Texas Motor Speedway in a Halloween spooktacular. Unfortunately, a fast truck was waylaid by mid-race contact from another competitor. Although Kennedy made an impressive save, a run through the grass led to overheating problems and required multiple pit stops to rectify, ultimately resulting in a 15th-place finish. After two solid practice sessions, Kennedy earned his Heater.com team a spot in the final round of knockout qualifying, scoring a fourth-place starting spot in the WinStar World Casino & Resort 350. After the green flag waved, Kennedy was still in the top 10 when the first caution flag waved on lap 23. 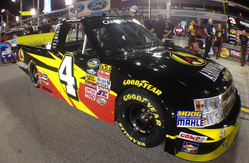 Reporting to crew chief Doug George that his truck was aero tight in traffic, the No. 31 team provided the young rookie with four tires, fuel and a track-bar adjustment. Over the course of the next 60 laps, Kennedy worked his way up to as high as sixth and was running lap times consistent with the leader. On lap 88, the 22-year-old was scored in the 12th spot when another competitor hit him from behind, causing the Heater.com Silverado to bobble and swerve into the grass. Kennedy made a skillful save, but a lap later he reported that his water temperature was high and his gauges were flashing. With temperatures reaching a critical level, Kennedy had no choice but to come to pit road under green to clean grass and dirt off of his grille. Quick work by the team allowed them to only lose one lap on pit road, but temperatures remained high under the hood of the Heater.com Silverado. When the caution flag waved on lap 97, Kennedy made two mores visits to pit road, allowing the team to thoroughly clean out all the grass and dirt that had accumulated under the hood and cool down the truck. Restarting in the 22nd position and a lap down on lap 102, it would require three more yellow flags before Kennedy would earn the lucky dog and return to the lead lap. One final caution set up the field for a green/white/checkered finish with Kennedy in 16th, and over the course of those two laps he was able to pick up one more spot, ultimately crossing the finish line in 15th. Kennedy is now ninth in the NCWTS Driver Point Standings. 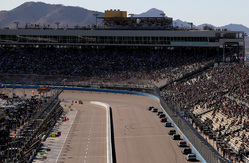 The NCWTS heads to Phoenix International Raceway for the penultimate race of the 2014 season. The Lucas Oil 150 will air live on Friday, November 7 at 8:30 p.m. EST on FOX Sports 1.